Lemon curd recipe adapted from My Baking Addiction. Lemon curd (recipe below). If using bought lemon curd, you will need 2 cups. Place sugar and eggs into a medium saucepan and whisk to combine. Whisk in lemon juice, lemon zest and butter. Place over medium heat on stovetop and whisk continuously until butter has melted and mixture comes to boil and thickens. You know it’s ready when the curd coats the back of a spoon. Strain mixture into bowl and cover with plastic wrap right onto the surface of the curd. Refrigerate for at least 4 hours until cold. Grease and line the base and sides of a 23cm springform tin. Pulse biscuits in a food processor until the mixture resembles fine breadcrumbs. Add the melted butter and pulse to combine. Press mixture firmly into the base of the tin and refrigerate for 15 minutes. Pre heat the oven to 160°C. Place the chilled lemon curd, sugar, cream cheese, vanilla and cornflour into an electric mixer fitted with the whisk attachment. Whisk on medium-high speed until well combined. Add the eggs one at a time, whisking well after each addition. Pour cheesecake filling over base and bake for an 1 hour or until the top is golden and the cheesecake is set but still a little wobbly in the middle. Leave cake in switched-off oven with door slightly ajar to cool completely. 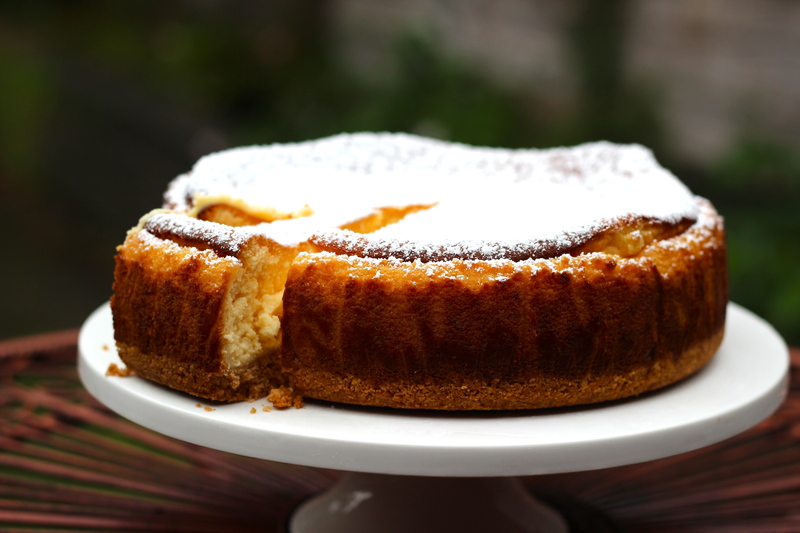 Remove cheesecake from tin when completely cool and dust with icing sugar to serve.